Drivers in New Delhi or Mumbai who turn the key on a new compressed natural gas (CNG) Celerio Green, may be surprised to find out that if they look under the hood they will find components from Vancouver-based Westport and its subsidiaries. 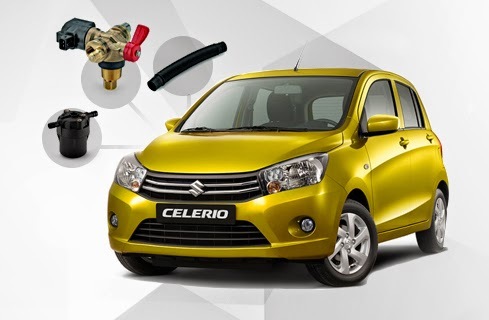 India’s Maruti Suzuki recently announced its Celerio is now available as a bi-fuel option: the Celerio Green. The five passenger, bi-fuel car runs on CNG and petrol (gasoline) and gets 31.79 km/kg when it’s in CNG mode. Westport is supplying the cylinder valve, low pressure filter and plastic venting hose for this recently announced addition to the Maruti Suzuki CNG car line up. Westport components are also under the hood of Maruti Suzuki’s WagonR, Eeco, and Ertiga CNG models, supplied through its subsidiary Emer, and Emer’s India-based joint venture, Minda Emer.